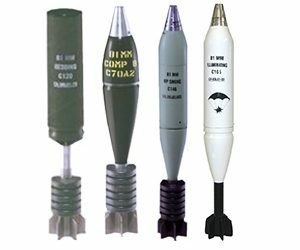 General Dynamics Ordnance and Tactical Systems – Canada (GD-OTS – Canada) manufactures five different types of 81mm Mortar rounds. The High Explosive (HE) – the Illuminating (ILL) – the Smoke, Red Phosphorous (RPS) – the Bedding C120. The 81mm High Explosive (HE) C70A2 mortar cartridge is the Canadian version of the British HE L41 series. It has six, equal charge increments fitted around a tail boom. The mortar body is manufactured from special cast iron and uses the well-proven DM111A4 fuze. The body uses a polycarbonate sealing ring which expands and seals under gas pressure. This highly reliable seal helps improve flight characteristics as well as provides increased range and reduced dispersion. The 81mm Illuminating (ILL) C105 mortar cartridge is in service with the Canadian Army since the mid 90’s. The tubular aluminum-alloy bomb body consists of front and rear sections that separate when the MTSQ DM93 time fuze functions. The propelling charge system is the same as that for the HE C70A2 cartridge, consisting of six, equal increment charges fitted around a tail boom. Nominal Maximum Range to Burst: 5,250 m (from L16A1 or similar mortars). Average Illuminating Intensity: 900,000 candelas for minimum of 35 s.
The 81 mm Smoke, Red Phosphorous (RPS) C146 mortar cartridge is in service with the Canadian Army for the last ten years. Designed for air burst, its payload of RP pellets is dispersed uniformly over a wide area, thereby reducing the risk of local and/or low smoke generation common with point detonating smoke bombs impacting soft ground. The propelling system is the same as that for the HE C70A2 cartridge, consisting of six, equal increment charges fitted around a tail boom. Nominal Maximum Range to Burst: 5,100 m.
Effective Smoke Emission: > 2 min (all climatic conditions). The 81 mm Bedding C120 mortar cartridge is a cost effective solution to firmly bed mortars on various types of grounds. Its payload breaks up on firing resulting in almost no signature that could be detected by enemy counter-battery radars. This provides for a very accurate aiming of the following HE rounds fired for effect. The propelling system is the same as that of the HE C70A2 consisting of six, equal increment charges fitted around a tail boom. It can be transported in the same plastic container as that of the HE C70A2. The C120 cartridge may also be used effectively as a training round. Left: Canadian Soldier sites an 81mm mortar. Right: Canadian soldier holds a prepared 81mm mortar round as his crew lays in the mortar prior to firing.